I wake up at 2:30 a.m. with a thought. What are the unhelpful things you can’t stop thinking about? No, it’s about something that happened some years ago. A contribution I made during a business breakfast meeting. The fact that it was a breakfast meeting plays into the story because there were platters of pastries on the table. I remember because I really wanted a croissant but didn’t want to be the only one to reach for one and was thinking I’d just grab it on my way out the door when the meeting was done. Anyway, I digress (pastries have that effect on me)… It’s 2:30 in the morning and I’m suddenly awake and thinking about what happened when I started speaking at this breakfast meeting. All was going well until, along with my persuasive and impactful words, a tiny bit of spittle escaped from my mouth. 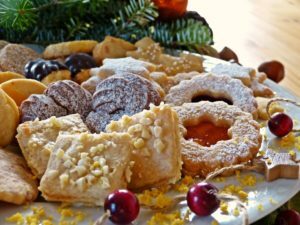 I could see it fly through the air – minuscule though it was – and watched it land smack dab in the middle of the tray of pastries. Next to the croissant I was eyeing. Just to the left of the cranberry scone. On top of what I’m sure was until that moment a coveted chocolate donut. And I froze for a second, unsure of protocol. Had anyone else seen it? It was tiny. Please tell me no one else just saw that. Should I apologize for unintentionally spitting on the tray of pastries? Should I pretend it didn’t happen? Should I remove the now offensive item with a napkin? Mortified, I continued, hoping no one would notice I just emitted bodily fluid or the fact that my cheeks were reddening in total embarrassment. What I had to say was important and effective. And I had ruined it by speaking so quickly and with such passion that I had somehow become unable to control my saliva and had accidentally Spit. On. A. Donut. And here I am, at 2:30 in the morning, not the next day but some three and a half years later, revisiting that moment in all its horrifying detail. Now I’m wide awake and embarrassed, as if it has just happened, breaking into a sweat under the covers and feeling that shame and anger at myself all over again. It’s like a party in my head, with uninvited guests that ruin a good night’s sleep, something I’ve written about before. If you missed that post, it’s an interesting dialogue from a completely unhelpful cast of characters. You can read it by clicking here. I’m a ruminator. Always have been. It’s like there’s an endless loop of gaffes and wrong moves and mistakes and “constructive feedback” running on a tape through my head, often at the most inopportune times. Like when I should be sleeping. Or when I should be just moving on in my story rather than re-reading a past and unpleasant chapter. It’s like I can’t get past it. It’s repetitively going over a thought or a problem without completion or without a solution. 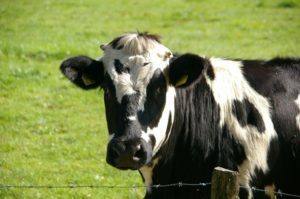 An alternate definition of rumination has to do with cows. Like chewing the cud – chewing again what has been chewed slightly and swallowed. It keeps coming back up and stays in your mouth (or brain) far longer than it should, a pasty, mealy meal. So, why do we do it? (Can I say “we” here? It can’t be just me who does this, right? Let me ruminate on that). 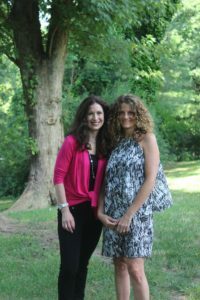 Golden and her business partner Joanna Kleinman, a LSCW therapist and Life Coach, run Dethroning Your Inner Critic. The company focuses on personal development to help clients transform their inner thought processes and live happier and more satisfying lives. Many of the issues that hold us back or trip us up, they say, start in childhood. Joanna and Emily help clients work on identifying the childhood stuff so they don’t carry the same issues through adulthood. “Ask yourself, Is this experience familiar? Have I been here before? What you’re doing isn’t getting you the results you want. Once you get that you are stuck in a place, owning that you are 100% responsible. You can choose to be victimized by the thought or you can own that you are completely responsible by the thoughts you are having,” Joanna says. But it’s not like a spent a lot of my childhood spitting on donuts. Or spitting on anything for that matter. And I didn’t spend it in business breakfast meetings. So, what gives? For me, that would be feeling foolish or making a mistake in front of people I want to impress. Such as making an important and valuable point at a meeting only to worry the message was lost because, you know… that whole spitting on the donut thing. It all makes sense to me. And yet, despite knowing better, I can’t stop the thoughts from re-occuring or popping in my head at all hours of the day. I would have preferred it didn’t happen at all. But since it has, how do I stop thinking about it? How do we Dethrone that Inner Critic that likes ruminating? Emily Golden (L) and Joanna Kleinman (R) are out to Dethrone Your Inner Critic. Joanna and Emily explain that rumination is different from reflection, which allows us to give serious thought or consideration to something from the past before moving on from it and creating room for growth and development. Rumination has no such value. I didn’t slip on a banana peel. I spit on a donut. It had the unintended effect of getting me off my pastry habit. And when you think about it, it’s kind of funny. Maybe if I replace the meaning of that event, I can remember it with less embarrassment and with more amusement. Waking up at 2:30 am in fits of laughter might be strange but it would be a lot more fun. Valerie Gordon is a long-time storyteller and award-winning television producer who has turned her attention to the impact the stories we tell have on our career success and satisfaction. She offers keynote presentations and group workshops on everything from storytelling as a negotiation strategy, perfecting your elevator pitch and crafting a successful next chapter. Find out what clients are saying about her impact. For more information on Dethroning Your Inner Critic, check out their website, follow them on LinkedIn or Facebook and @dethroningyourinnercritic on Instagram.